“Chicken pot pie,” I said as casually as I could, expecting some new outburst of complaint. But something she’d seen on Facebook had already caught my daughter’s attention. Against a flurry of keyboard taps I closed the door and turned back to my own latest obsession. At the dinner table, there was an audible silence I did my best to ignore. My son slipped into his chair, adjusted the glasses on his nose, and moved the green beans to get a better look. My daughter carefully lifted the crust with her fork, and looked quietly at her brother. I felt their eyes linger on me as, with serious concentration, I took my first luscious bite. Something in the air relaxed; my new creation had passed the test. Before I knew it the pot pie on my kids’ plates had disappeared without a trace. My teenaged daughter’s friend was cruising the fridge the next day looking for a snack. “There’s pot pie,” my daughter said casually – as if she’d been eating it all her life. “It’s really good. Here, I’ll heat some up.” She cut off a hunk and refused to catch my eye as she bent to her task. I went back to reading David Sedaris digressing about the weirdness of his life. Okay, I thought: I could hold my silence. I didn’t even crack a smile. But I was laughing inside. Make the pastry: Preheat oven to 375°. In a large bowl, mix together flour and salt. Cut in cold butter and shortening with two dinner knives or a pastry cutter until the bits of fat are the size of peas. Quickly go through with your fingers to crumble them into the flour as best you can. Now add just enough cold water to make the dough into a ball that barely sticks together. On a floured surface, roll 2/3 of the pastry dough into a 13” x 13” square. Use this to line an 8” x 8” pyrex baking pan, bringing the edges of the dough up over the lip of the pan to prevent slippage. Poke the dough all over with a fork and bake the shell for 12 – 15 minutes on a center rack until lightly browned. Make the filling: Put the diced carrots and potatoes into a 1-quart sauce pan, cover with water and bring to a boil over medium heat. Cook for 10 minutes until barely tender. Drain water and set the veggies aside. In a large sauté pan, fry ½ cup of chopped onion in 3 Tablespoons of butter for 4 or 5 minutes until golden. Stir in 4 Tablespoons of flour until if forms a mass. Add ¼ cup milk, heat and stir; add the other ¼ cup milk, heat and stir until there are no lumps. Now add chicken stock in ½ cup portions, allowing each portion to heat thoroughly before stirring it into the flour mixture. Mix well to ensure there are no lumps and let the sauce bubble before adding the next portion of stock. After 5 minutes or so, once all 2½ cups of stock have been added, you should end up with a smooth gravy flecked with onion. Add chopped mushroom to the gravy, lower the heat and clap on the lid. Let simmer for a few minutes until the mushroom is mostly cooked. Stir in the carrots and potato, simmer a few minutes more, and then turn off the burner. Assemble the pot pie: Roll the last 1/3 of pastry dough into a 9” x 9” square. Fold diced chicken and frozen peas into the gravy mixture; season with salt and pepper to taste. Scoop or pour the filling into the baked pie shell. Wet the rim of the shell with a bit of water or milk and then put the square of pastry dough over the pie, trimming and sealing the edges as needed. Cut 8 small slits in the top and add a design if desired. Bake the pot pie: Bake on the center rack at 375° for 35 to 40 minutes, until the sauce bubbles through the slits and the crust is golden brown. Let cool for 15 minutes before serving. Add your own whimsical design; your family will love it! Looks delicious and creamy! I love the crust decoration, haha. I’d definitely make it a moose. Dontcha just love it when you make something that your kids are convinced they will hate and they scarf it down like there’s no tomorrow??? Parental vindication at its best. 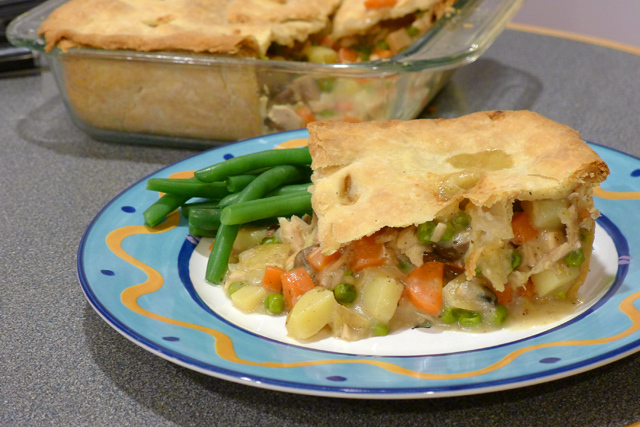 This is one fabulous looking pot pie and I definitely want to try it! This is definitely a hit Don!!!! 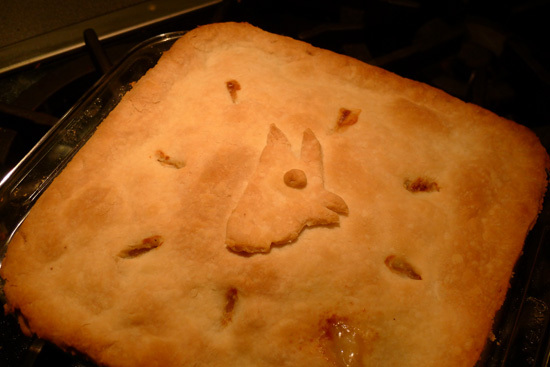 Your chicken pot pie looks amazing. I have some left over chicken from a spatchcock chicken I grilled the other night. Now I know what I am going to do with it. Thanks for sharing. Also, loved the way you described your kids and their reaction. I could picture it in my head crystel clear. Gotta love it when they end up liking something they think they are going to hate. Cute story, gotta love kids. These pot pie looks incredible. 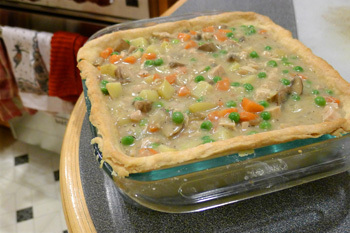 There is just something about a nice pot pie on a cold day. Of course it was a hit!